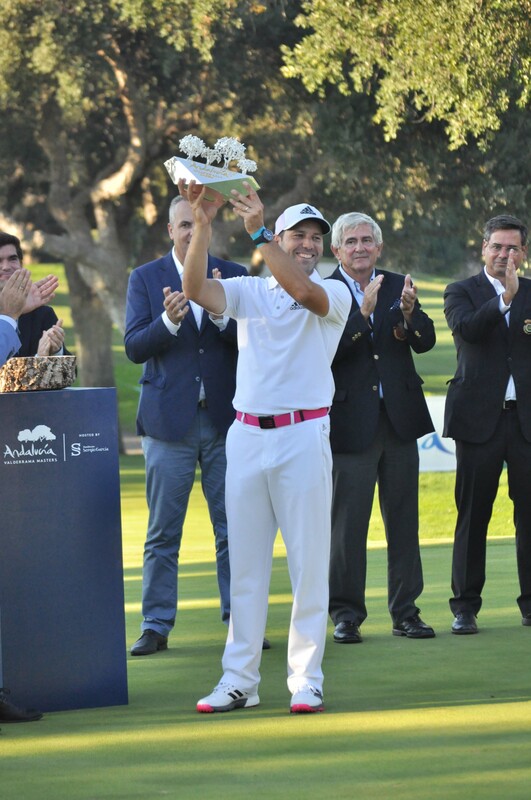 Sergio García took the Andalucía Masters title last weekend at the Valderrama Golf course on the Costa del Sol. The four-day event saw an exciting play-off between García and Dutch Joost Luiten in front of record spectator figures. The win seals the best season of the Spanish golfer’s career. The Costa del Sol aka the Costa del Golf lived up to both its names at the Andalucía Masters tournament held at Valderrama in Sotogrande. Sunshine and warm temperatures ensured great playing conditions on a course in its finest conditions. Over 41,000 people turned out over the four days including 15,000 on the final nail-biting day. Sergio García’s main rival at the tournament was always the Dutch Joost Luiten. On the first day of play, both golfers stood neck and neck. Luiten made the tournament that much tougher for García on Friday when he played a spectacular albatross. The three under par prowess will probably go down as one of the best shots ever seen on Valderrama golf course and in the Andalucía Masters Tournament. By the final day, García had clinched the lead again with a quartet of birdies on the 5th, 9th, 10th and 11th holes. However, he ran into trouble on the 12th, which Luiten followed with a birdie on the 13th. Tensions ran high in the final five holes and at the 15th both golfers were tying for first place. A slip-up by Luiten at the 16th left it up to García to clinch the game. The Spaniard delivered with a perfect putt to make a birdie at the 17th to the delight of the huge crowd. García won the Andalucía Masters with a final score of 67, 12 under par. Luiten took second place with 68. Completing the top five were British Daniel Brooks (7 under par), Jamie Donaldson (5 under par) and the Australian Wade Ormsby (4 under par). His victory at the Andalucía Masters seals an excellent year for Sergio García. Many golf analysts go one step further and point to it as the best season of his career. Not only has he triumphed at Valderrama for the second time (his first win was in 2011), García also won the Masters in Augusta. In recognition of his win at Augusta in April, García has been awarded Honorary Life Membership of the European Tour. This honour makes him the 53rd player in this exclusive list that includes the world’s best golfers. Only two other Spaniards feature on the list – golfing legend Severiano Ballesteros and the great José María Olazábal. García has won the European Tour 13 times in total. As well as winning the Andalucía Masters tournament, Sergio García hosted the event at Valderrama through his charitable foundation. “It means an awful lot to me and to play here is an honour. To win twice at my favourite course is difficult to beat,” he said, summing up the event. Discover the Costa del Sol and Costa del Golf for yourself and book your round now. Photo: Courtesy of Golf Circus. Although golf tends to be thought of as an older person’s sport, it is in fact a game for all ages. Its complexity, etiquette and demanding self-control makes it an ideal sport for everyone, even the smallest members of the family. Experts point out that children as young as five can be initiated in the game and kids of any age stand to benefit from playing. Read on to discover eight benefits of golf for kids. Easter is one of the most colourful times of the year on the Costa del Sol when every resort celebrates Holy Week with processions. The pageantry goes back centuries and you’ll see some of the Andalusia’s oldest traditions at Easter on the Costa del Sol. Events take place everywhere, but we’ve highlighted five things you shouldn’t miss when you’re on the Costa del Sol at Easter. If you want to get better at golf, you need time, practice and patience. And all three in big doses. Having the right equipment helps, of course, but if you’re looking to improve your game, take a look at your habits. Are they the best? Read on to discover six habits you should pack in your bag along with your clubs every time you head for one of the golf courses on the Costa del Sol.